Sukkot (ie the Festival of Booths) is coming up and the mad rush for a set of seemingly arbitrary plant cuttings and citrons begins. Down the street from where Noemie and I live, the sidewalk has become a strange parody of an open market, but only selling four items. 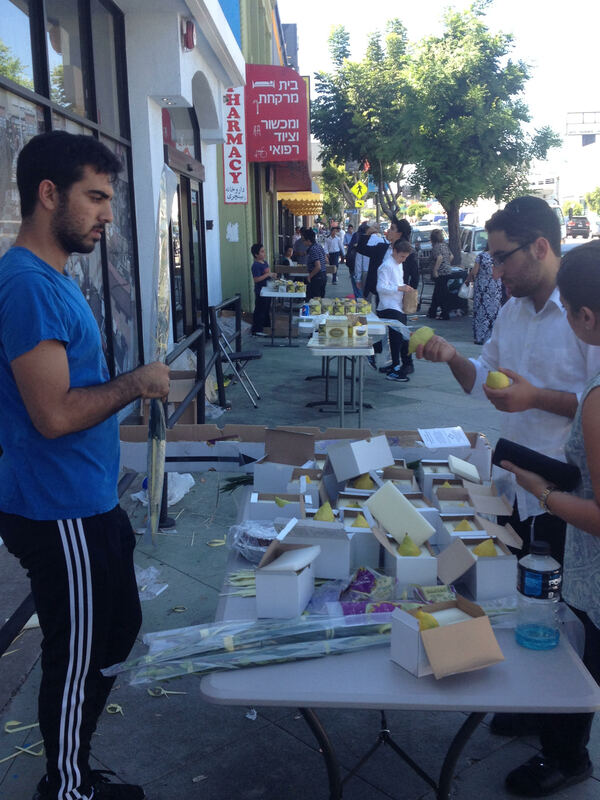 After perusing up and down Pico boulevard and checking with each of the young men (ranging from 8 years old to about 18), I decided to purchase a set of the “four species” (palm, myrtle, willow, and citron/etrog) from young men raising money for their school. They are pictured above. Selling the four species on the street is often a way young men and boys make a few extra dollars or raise money for charity. I explained about Sukkot, the Booth Festival, but then had to explain about why we had these four odd species of plant. “The festival of booths, from the bible,” I began, “includes a ritual where we waive these species around as a form of prayer.” He seemed satisfied by my explanation, but I did not explain the economics of why the citron (etrog) is so expensive. So expensive in fact, that if you buy one you get the other three species for free. This year they started around $30 and can go up to hundreds of dollars. 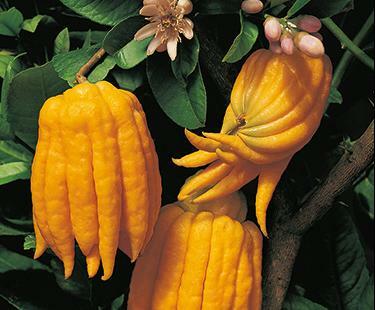 While the other three species are easy to find at any florist, the citron has special requirements. The Torah states that one must “take for yourself the fruit of a beautiful trees” for the Sukkot. Archaeological references directly linking the fruit mentioned to the citron/etrog in Jewish practice go back at least as far as the Second Temple period (ending in 70 CE). It was widely cultivated in the area around what is now the State of Israel. Why is it so expensive? The fruit has to come from a citron tree with a proper pedigree. Citrons/etrogs are hard to grow and it is must easier to graft a citron tree to a lemon tree. Unfortunately, grafting an etrog tree makes the fruit invalid for use in the Sukkot ritual. Not only must the tree not be grafted, but it cannot be grown from the seeds of a tree that has been grafted. This requirement goes back to the tree’s grand parents, great grand parents, etc, ad infinitum. 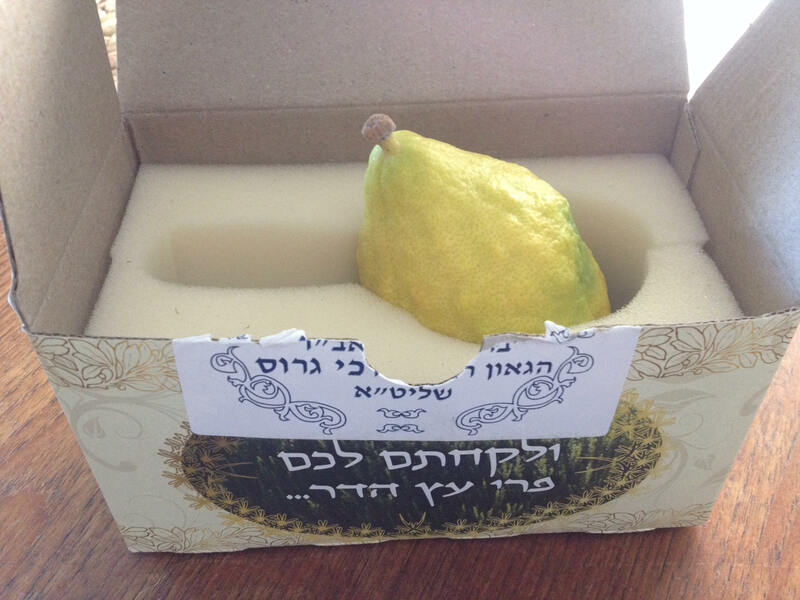 As with all things in the kosher world, an etrog with a proper pedigree (in a sealed box) gets a hefty markup. Notice the sticker that certifies rabbinic supervision (and held the box closed to prevent tampering). It states the etrog is deemed fit for use by Rabbi Mordechai Gross, Shlita. Shlita by the way, is an honorific for a rabbi meaning: Sh’yechiei l’orech yomim tovim amen (may he have long and good days/a long good life). The tendency to use charedi (ultra-Orthodox) kosher certification is theoretically to allow for a maximum market for one’s product. It also means that Rabbi Mordechai Gross gets paid. Additionally, the fruit comes in several varieties. Some have a small knob on the end known as a “pitom.” It is part of the fruit that usually falls off during growing, but if the fruit is grown under gentle conditions it can stay on. If the etrog is the type with a pitom, and the pitom falls off before harvest or during transit, the fruit becomes worthless. If however, the variety of etrog naturally grows without a pitom, then it is valid for use during the Sukkot ritual. Fruits with pitoms are considered more beautiful and thus more desirable, and thus more expensive. In the film, a Chassidic family decides to spend a small fortune to buy the most beautiful etrog of the year. As with any supply and demand issue (especially kosher items with limited supply), the prices climb. Last year, Noemie and I waited until right before Sukkot began to buy the four species, and thus ended up paying $60 for the least expensive set available. Of course, like pumpkins the fruits are much more expensive leading up to a holiday. After the holiday they are virtually worthless. Welcome to an extremely strange niche market. Chag somayach.